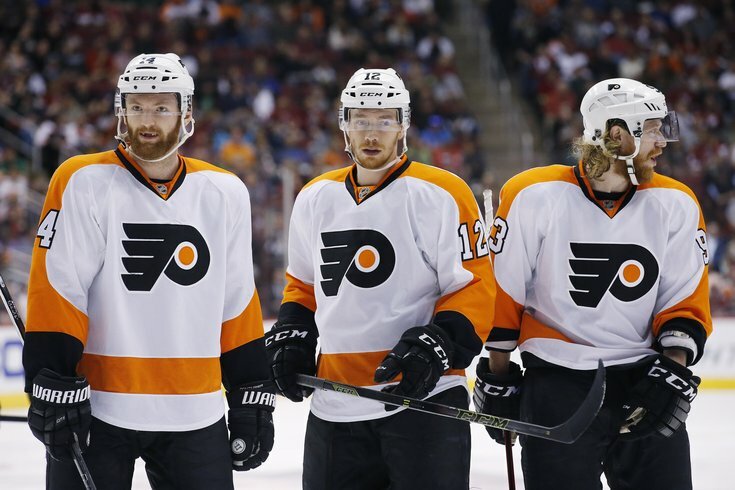 Philadelphia Flyers forward Sean Couturier (14), Michael Raffl (12) and Jakub Voracek (93). The Philadelphia Flyers season may have ended with a first-round loss to the Washington Capitals, but it was far from a disappointment. Not only did the team scrap and claw to the Eastern Conference's final playoff spot in the season's penultimate game, but they also showed us something in the postseason when they refused to fold after going down 3-0 to the Caps, nearly sending the series back to D.C. for a Game 7. There's also the long view of the season, and how the emergence of players like Shayne Gostisbehere should make you feel pretty good about the direction in which this team is headed. That's why it wasn't much of a surprise to see plenty of positives results in our Flyers' Stay or Go poll. We asked you guys to vote on 27 players, plus the coach and GM, and all but nine of them came back with 50 percent or more of fans wanting them to come back next season. Part of that can be attributed to the two guys at the top, coach Dave Hakstol and GM Ron Hextall; each received an overwhelming 99 percent to stay. Often, these polls become a popularity contest. You'll use the numbers and logic for the most part, but there are just guys you like. You can't quite explain it, but for those players, you ignore your head and follow your heart. And that's totally fine. To help you navigate those sometimes tricky waters, we've broken them down into groups -- or cliques -- based to just how popular each player was our poll. If you're sitting at this table, you don't have much to worry about. Unless your last name is Schenn and you're about to become a free agent. Despite being tied with Wayne Simmonds and Michal Neuvirth as the most popular player on the team, Schenn could be playing in a different uniform next season if GM Ron Hextall doesn't think he's worth the big contract he'll likely command should he hit the open market. Luckily, he's a restricted free agent, meaning the Flyers will be able to match any offers. The question now is, how much (and how many years) will other teams -- and will that price be too much for Hextall to swallow. Another one of the most popular players is goalie Michal Neuvirth, who missed the stretch run in which the Flyers clawed back into playoff position, but became a fan favorite after he returned from injury to help his team extend their series against the Capitals with incredible performances in Games 4 and 5. After that, it's not surprising to see him at this table. What is surprising, however, is the fact that Steve Mason, who had a hell of a run leading up to the postseason, isn't on this list. Instead, he's 30 points behind Neuvirth. It's rare that you see the teacher and principal -- in this case Hakstol and Hextall, respectively -- sitting with the cool kids, but I guess that just proves how popular they really are. The rest of this table looks about how you would expect, with one notable name missing. Do you see it? Moving on from the popular kids, we now arrive at a misfit table. Not because the players themselves are misfits, but because the more you look at it, the more you wonder how some of these names are mixed together. At one point or another, these guys either were hanging with the popular kids and are one their way towards the outcast table OR were down on the lower rungs of this fictitious high school hierarchy and are now on their way up to joining the cool kids. The former describes guys like Jake Voracek and Steve Mason. Voracek finished the season fourth on the team in scoring -- behind on Claude Giroux, Wayne Simmonds and Brayden Schenn -- with 55 points in 73 regular season games (plus one point in six postseason games). While that may be his lowest point total in an 82-game season since his first with the Flyers (49 points in 2011-12), one must separate Voracek's season into three parts before saying he underachieved. In the early parts of the season, Voracek struggled mightily to get started scoring. In his first 30 games of the season, the Flyers forward had 16 points and just one goal. Over his next 30 games, Voracek notched 32 points, including nine goals. That 30-game stretch also included a string of 10 games in which he tallied 16 points (4G, 12A) and at least one point in nine of them. But then the 26-year-old suffered a foot injury that sidelined him for nearly a month. And when he returned, he looked much more like the Voracek we saw in the first 30 games of the season, not the 30 that preceded his ill-timed injury. In his final 19 games (13 regular season and 6 postseason), Voracek notched just eight points (2G, 6A). And that's likely the reason the NHL's fourth-leading scorer from a year ago has been relegated to this table. Much like Steve Mason, it's all about #WhatHaveYouDoneForMeLately. We're not really sure what to make of the kids sitting at this table. But since we've never heard of the music they're listening to and their clothes are from a thrift store, we just can't get a read on them. They have the ability to surprise us (in a good way), but we're often left shaking our collective head in disbelief. Like, it's cool that you ride a bike to help the environment. Wait, that's not why you're doing it? Sometimes, they can be among the worst players on the team. 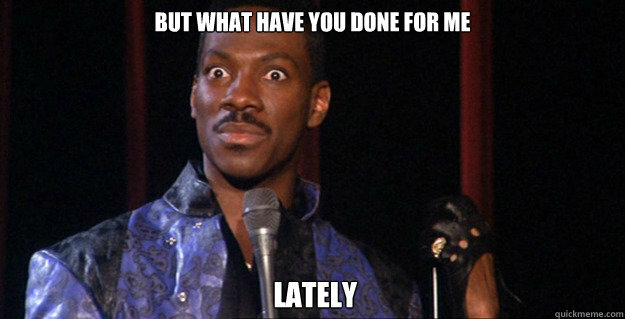 Other times, however, they block five Ovechkin shots in one game. The fact that Mark Streit and Andrew MacDonald are only separated by seven percentage points is confusing. As is Sam Gagner -- who carried a $3.2M cap hit this year and is an impending unrestricted free agent -- somehow getting 40% of people to vote for him to stay. I don't know what acting coach he hired to help endear himself to fans and win over some votes, but it worked. He finished with just 16 points (8G, 8A) in 53 games this season and is all but guaranteed to be playing somewhere else next season. I'm not sure why there's so much hate for Matt Read. While I'm not 100 percent sold on the fact that he should stay -- you could probably persuade me with a good argument -- I certainly don't think he should be second from the bottom in terms of popularity. Yes, his 26 points this season are his fewest in a non-lockout season throughout his five-year career with the Flyers, but he's still scoring at about the same rate as he did last year (1 point every 46.34 minutes of ice time in 2015-16 compared to one every 48.83 minutes the season prior). Medvedev, on the other hand, is a totally different story. And, like Sam Gagner, he'll soon be an unrestricted free agent. He carried a $3M cap hit in 2015-16 and couldn't stay on the ice on a regular basis, including spending nearly the entire final month of the season as a healthy scratch. And he didn't see any time during their playoff series against the Caps. It's a safe bet that the 33-year-old will be gone after just one season with the Flyers (which was also his first in the NHL).